My thoughts about life as I see it, and the books that I read. Readers of this blog will know that I have participated in the NaNoWriMo challenge, which involved writing a 50,000 word novel in 30 days. 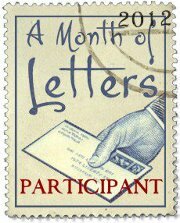 I have decided to participate in a new challenge, the Month of Letters challenge, which requires participants to write 24 letters and send them by mail during February. I have a long history of writing letters. I started corresponding with penpals as a teenager, and during my teens and twenties I was in touch with 20 or more penpals at any given time, in many different countries. Before the Internet, communicating by mail was normal. Airmail letters took about 5-10 days to reach their destination. I remember the daily thrill of seeing what had arrived in my letter box. Letters also sometimes contained photos, postcards, and "friendship books", little stapled booklets in which penpals wrote their addresses and interests and passed them on, hoping to receive letters from similar people. This primitive form of social networking was quite effective, for the time. Of course, writing letters was a good excuse to buy pretty writing paper, stickers, rubber stamps, and coloured pens. At that time, my handwriting was much better than it is now. Later, when I started using a computer, I learned how to insert images into the text, and printed letters on coloured paper. As time wore on, I lost contact with most of my penpals, and stayed in touch only with the few who were my closest friends. In recent years, I have renewed contact with a few of them through Facebook. I have been fortunate to meet a few of my penpals when they came to Israel or when I visited their country. I have been thinking about this recently, with a growing awareness of the differences between my way of life when I was younger and today's online lifestyle. So when I found out about this challenge, it appealed to me. I will spend February writing (well, typing) letters to my current penpals, and also to a few friends and relatives. There is an art to writing a good letter, and while it is possible to do this in an email, the tendency is to keep emails short. In some cases, my main contact with my penpals in recent years has been reading each other's Facebook status updates and blogs. I want to rediscover the experience of writing and sending "real" letters, and hope to receive some replies from my friends as well. Your post today appeals to me so much! Once I had 100 pen pals and at some point I could not cope anymore. I still have some of my old pen pals like you but the amazing thing is that through the Internet and the blogland and sea glass sites I have met many more people and we e-mail even daily and we exchange letters and parcels and some of them I have met as well!Times change. I wish I had kept all those old letters of my childhood and teenage years!AriadnefromGreece! So, are you going to try the challenge during February, Ariadne? I thought about it and I do have lots of letters to answer back that came at Christmas. The impossible for me is to post so many things. I am trying to post one or two things every week to keep costs down as mail has risen so much!So no I am not taking the challenge, but maybe I will do it my way! Write the letters but post them when I can!AriadnefromGreece! I welcome comments on this blog. Comments are moderated and will only be published after I approve them. Please write comments in English only, and be careful with your spelling.